Ford, DUB magazine, and Roush Industries come together again in 2012 to offer this DUB Limited Edition Mustang. DUB edition starts with a V6 Mustang coupe or convertible. Modifications include; Roush front fascia and splitter, Roush lowered suspension, 3.31 rear axle, quarter window covers, DUB stripe package, black interior with DUB embroidered into the headrests, unique 20-inch Pirelli wheels, and TIS tires. 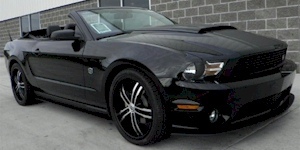 Black 2012 Roush DUB Special Edition V6 Mustang coupe with black stripes and special 20-inch wheels. It has DUB badging in the special blacked out grille, on the fenders, and rear. Does the car look lower? It's been lowered 1-inch as well!